Warren, OH - Wheatland Tube Company, a leading manufacturer of welded steel pipe and tubular products, has installed an enormous Braner/Loopco Single-Loop Turret Head™ Coil Slitting Line in its Warren, OH manufacturing facility. 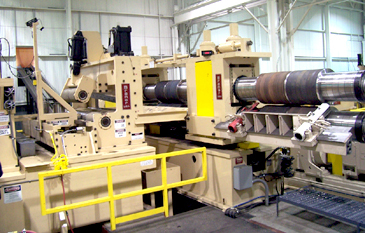 The new Slitting Line is capable of processing 80,000# x 72" wide x 100,000 PSI yield strength hot rolled, pickled, galvanized, and stainless steel coils in gauges from .065" through 3/8" at line speeds to 600 FPM. The Slitting Line is equipped with Entry and Exit coil storage equipment, Twin Expanding Stub Uncoiler, Entry Coil Straightener & Shear, a Turret Head™ Slitter with two quick-change 12" slitter heads, Scrap Choppers, heavy-gauge strip tensioning equipment, a 2-ratio Recoiler, and 1,000 HP for processing heavy-gauge hi-strength coils. 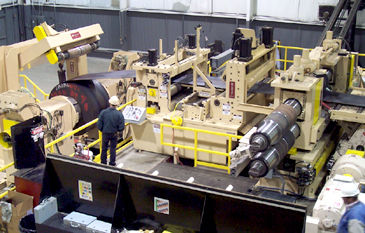 80,000# x 72" x 3/8" Single-Loop Turret Head™ Slitting Line. Notice Crop Shear & Chopper conveyors deliver scrap to outdoor scrap boxes. Unique entry Coil Staging & Loading: Four 80,000# x 72" wide x 84" OD coils are staged ahead of the Slitting Line on a 4-Coil Turntable that supports the coils from the coil OD. The Turntable allows quick and easy coil loading and coil selection. A Rotary Deck Coil Car retrieves coils from the Turntable, rotates coils 90-degrees, and loads coils onto the Twin Expanding Stub Uncoiler. 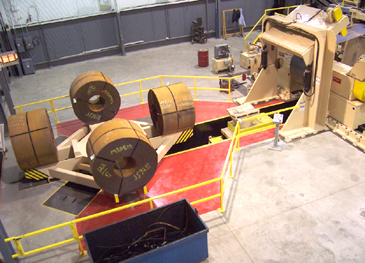 The equipment is arranged to permit coils to be crane loaded onto or unloaded from the Coil Car. Coil Storage Turntable w/ Rotary Deck Coil Car services the Twin Stub Uncoiler. Entry End: The Wheatland Uncoiler handles .065" to 3/8" gauge coils from 20" wide through 72" wide with coil IDs from 24" through 34" on a pair of opposed expanding Uncoiler drums. Both Uncoiler drums are equipped with drag brakes and reversing jog drives. A huge free-standing Hold-Down assists threading hi-strength coil. A quick-open powered Straightener removes head end coil-set and the tail end coil "hook" for fast threading and safe tail-out. A Laser Edge Guide combined with hydraulic cylinder positioned Roller Side Guides assure coil alignment with the Slitter. A hydraulic Guillotine Shear crops-off hot band coil heads and tails. A power Tail Feed Roll ejects sheared head and tail scrap into a powered Scrap Cart that travels away from the Slitting Line and dumps the scrap into a container outside the building. 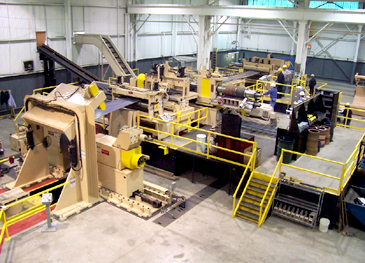 View of Uncoiler, Hold-Down, STraightener, Guides, & Shear ahead of the Turret Head™ Slitter. Turret Head™ Slitter: A 12" arbor x 350 HP two (2) head quick-change Turret Head™ Slitter produces precise width tolerance slit strips with minimum burr throughout the entire range of gauges and mechanical properties. The Slitter arbors are mounted in precision machine tool bearings installed in massive one-piece stress-relieved and precision ground solid steel block arbor bearing housings that weigh 2-1/2 tons each. The rotatable inboard Turret housing is supported on a huge anti-friction bearing, and the hydraulic cylinder positioned outboard bearing housing is mounted on zero-maintenance anti-friction precision machine tool slides. Huge aluminum-bronze gibs contain the vertically adjustable upper arbor bearing boxes and allow for "zero" axial arbor movement. The upper arbor bearing boxes are positioned by motorized anti-backlash screw jacks equipped with electronic encoder digital position readouts for fast and precise positioning. The Turret Head™ Slitter design allows re-tooling and head changes to be accomplished faster than with any other slitter design. Open and accessible arbors cut re-tooling time; there are ho housings or bases that interfere with re-tooling.